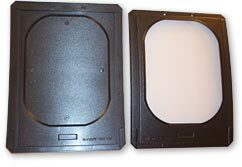 This developmental window bezel was formed by Magee Plastics Company of Warrendale, Pennsylvania using Fortron 1130LO PPS. Glass reinforced PPS was selected for several reasons including a high strength to weight ratio and inherent flame and burn resistance. As with all interior cabin components, PPS met or exceeds all of the specification requirements for smoke contribution and toxicity levels. The Fortron 1130L0 sheet was provided by ENSINGER/PennFibre in .125” thickness.